With the 2018 Good Life Halfsy closing in on having all 50 states registered, it seems only fitting that we take the time to talk about your racecation to good ol’ Lincoln, Nebraska. Beyond the Halfsy weekend activities, we invite you to explore Lincoln and see why this Nebraska’s capital city is one of the nation’s best-kept secrets. Whether you are a Nebraska native or an out-of-state visitor, there’s always something for everyone. After you decide how you’re traveling to The Good Life (car? plane? bus? ), the next thing you’ll need to figure out is where to stay. Lucky for you, we’ve lined up some comfortable race weekend digs for you! You’re sure to feel at home and, better yet, be close to all the action at these hotels. Our Official Host Hotel is Embassy Suites by Hilton located at 1040 P Street in Downtown Lincoln. 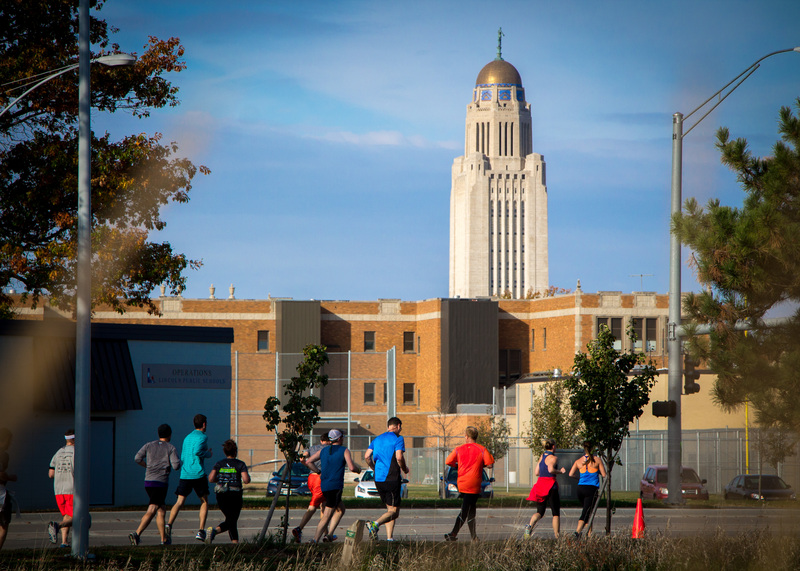 In addition to it being just minutes from many of Lincoln’s most popular attractions, it is also home of Packet Pickup & Run Expo. Yup, that means you just have to run downstairs to get your race swag, buy some Halfsy merch, and listen to some awesome expo speakers. Plus! As an Embassy guest, you can ride the shuttle to the start line. It’s a first come first served basis. Just sign in during check-in! We’ve arranged special rates for race weekend, but rooms are limited. You can book over the phone at (402) 474-1111 and just ask for the “Good Life Halfsy” group rate or book online here and enter the “HAL” code in the “Group Code” field. Candlewood Suites is located at 4100 Pioneer Woods Drive. It is the closest hotel to the Halfsy start line. To get a special rate for race weekend, book over the phone at (402) 420-0330 and just ask for the “Good Life Halfsy” group rate. The capitol building is the perfect place to begin your tour of Lincoln. The interior of this must-see-jewel tells Nebraska’s history through carvings, mosaics, paintings, sculpture, inscriptions and inlaid wood. Don’t forget to watch for it on race day… You’ll see it in the distance! If you’re anything like our crew, a local brewery is a must when you visit a new city. Blue Blood Brewing Co. sist above a 5,000 sq.ft. cave, Robbers Cave, and it’s open it to the public three times a week for tours. Each tour includes a tour of the brewery floor and Robbers Cave. Bringing the family with you? Of course you are… There’s no half-marathon support like your little ones! There’s plenty of things here to keep them entertained. Just a short drive from downtown Lincoln is the Omaha Henry Doorly Zoo. Voted #2 as Best Zoo in USA Today’s 10Best Readers’ Choice Travel Awards, this 160-acre zoo full of plants, animals and unique habitats from around the world is a sight to see. It’ll capture your little one’s hearts and imagination for a full day of fun. Can’t make it over to Omaha? No worries! There’s a wonderful children’s zoo right here in Lincoln. And lucky for your littles, Boo at the Zoo will take place the weekend you’re here (October 26 – 30) from 5:30 pm – 8 pm. Boo at the Zoo is Lincoln’s largest trick-or-treat event. The entire family will love stopping at over 40 trick-or-treat booths to get candy, coupons, and more. Just don’t forget their Halloween costume in your luggage! That wasn’t enough? Alright, there’s STILL more! Check out the Lincoln’s Visitor Guide here to see 100 pages full of what the city has to offer! We told you earlier a good local brew is a must. If you want a cold one to relax with and celebrate your PR on the Halfsy course, there’s so many around Lincoln to try. Here’s a list of our favorites: Zipline Brewing Co., Code Beer Co., Kinkaider Brewing Co., and White Elm Brewing Co.
Alright, so yes, this is a fast food restaurant. But if you’re from out-of-town and have never heard of a Runza before, eating a Runza sandwich the most midwestern thing you can do while you’re here. It’s beef, cabbage, and onions all wrapped up in fresh-baked bread. You’ll thank us later. If you’re looking for a burger joint in Lincoln, there’s only one place to head. Honest Abe’s has multiple locations and one is downtown just minutes from the finish line. There’s always a crazy new selection of rotating burgers to try and delicious parmesan truffle fries. Add a Carmel Apple Shake to your order. I promise you won’t regret it. If you or your little ones have a dairy or gluten allergy and you’re looking for something sweet, this adorable little bakery is the best place to go. From the neon good life sign on the wall by the front door to the colorful macaroon toys in the bathroom, this place is bursting with color from its seams. Try the crumble-buns! Man, oh man, there are so many good places around town. We’ve rounded up a few more of our favorites on our website here.